Four steps to stronger and more independent teams by John McCarthy, Ed.S. We all want the same thing. We want students able to work well with others. Every learner should be fully invested in the collaborative needs of their team so that the work is evenly balanced and highly productive. But the secret truth for most educators is that when a team becomes dysfunctional, we’d like for students to work out the problems themselves, and not need teacher assistance. Because if they could just resolve conflicts themselves, there is a higher likelihood that work quality can flourish. We want students to work well in teams and address problems when they arise without outside assistance. But students need coaching on team dynamics as much as they need it in developing an in-depth understanding of course content. From my early travels among schools that developed strong team culture, one particular standout was a collection of schools from the New Tech Network. They called their protocol “The Firing Clause”. Interviewed students said that few students got “fired” because issues were addressed early in the Project-Based unit. Some students stated that they got fired from a team only once because they did not want to go through the experience again. The great news is that in these cultures, students learned how to address problems early, and mediate the concerns. The problem is that some teachers who adopted this idea and created a process found that the term “Firing Clause” became a focus of their students and community. The steps for addressing issues seemed more like documentation of an impending firing, instead of mediating concerns before they grow into deep seeded conflicts. The key to a successful protocol for such a sensitive and serious matter of team functions is to frame it in concrete steps that promote communication while presuming positive intentionality. Here’s how these four steps work. One to One meeting by a team member and the student (May occur 2-3 times). When an issue arises, such as someone not getting their work done or showing disruptive behavior, a team member has a one to one conversation with the person. The intent of this personal approach is to avoid the perception of the individual feeling ganged up on. The focus of the conversation is to find a solution that address the team need, such as “What help do you need to complete work or get it done on time” or “How could the “joking” (aka sarcasm) be reduced because it’s affecting teammates?” Once an agreement is made, the meeting ends. If the terms are not met, there will be another meeting either by the same team member or a different person to help the individual. Many times the problem can be resolved at this step. Team meeting with the student. If the problems persists where the student is not following through on the agreed upon solutions, then there is a team meeting. The group reflects on the concerns, sharing each person’s perspective with the intent of finding a viable approach to resolution. The focus is on how the team can support the team process and the person who is struggling. Once a solution is agreed upon, the meeting concludes. Teacher meets with the team. During the previous stages, the teacher may facilitate the sessions, but not be an active participant in the discussions. If the team cannot resolve the issue(s) with the first 2 steps, then the teacher joins the team meeting as an active participant. It’s important that the teacher not take sides. Ensure that all voices are heard and the team norms are followed. Make suggestions for possible solutions where appropriate. In the end, a plan is crafted for how the team will resolve the issue so that they can function appropriately together. Option One: The teacher removes from the team the student who is unable to work with the team, when the first 3 steps have not worked. Option Two: The team decides if the student who struggles with the team should remain or be relocated. The student has a say as well. Sometimes the gravity of the situation is enough to find resolution. The teacher facilitates, and does not participate in the discussion and decisions made. Only at step three does the teacher become a participant in addition to facilitating. Establishing team norms is an important need so that students are empowered to communicate and collaborate in a constructive and positive way. Facilitate the class crafting up to 7 norms that describe the behaviors that will support teamwork and learning. Here are resources to explore this important step. The 3rd link offers an effective strategy for developing the norms and having group buy-in. PLC Norms: What are Norms? 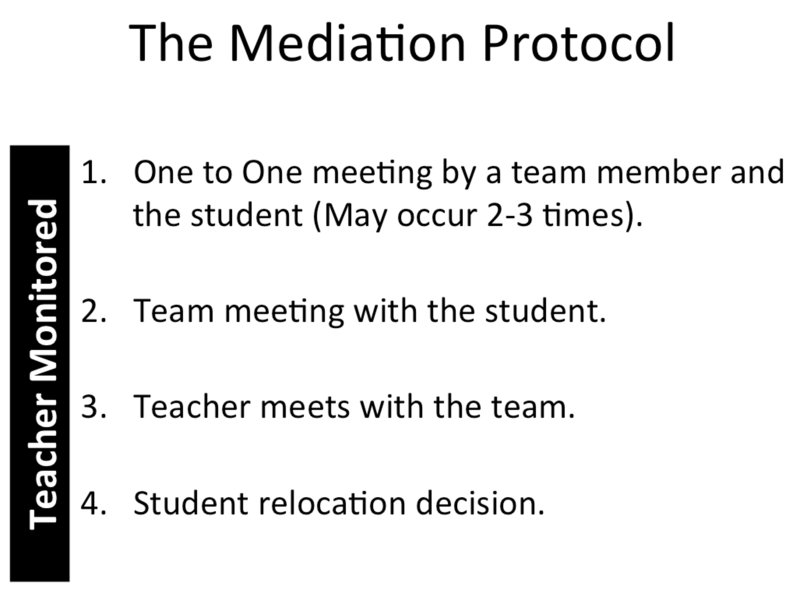 With teacher facilitation and team norms, the Mediation Protocol empowers students to take ownership of their learning environment. No longer are students waiting “helplessly” until the teacher deals with the team’s problem. Following the protocol, students develop communication and collaboration skills that will help them in every phase of their lives, from school settings to the workplace. 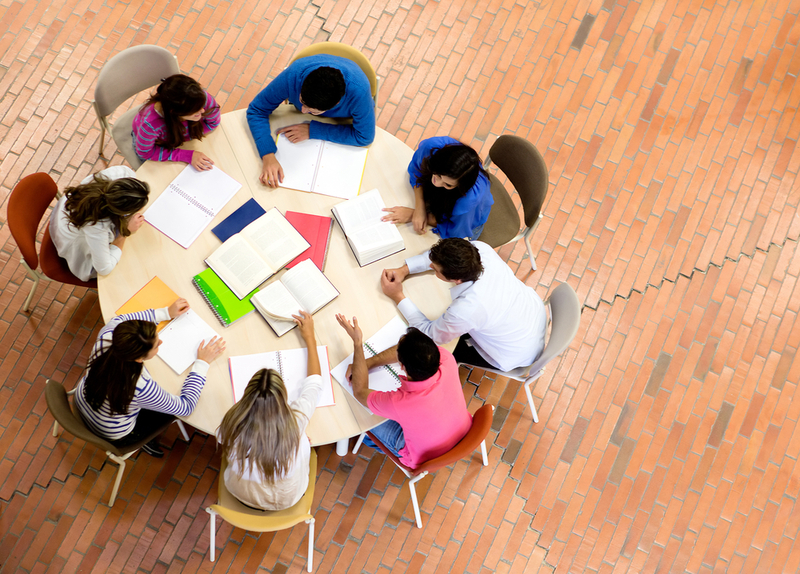 Establishing the Mediation Protocol is embedded in coaching students how to work as a team, which uses time efficiently to establish the structure. Culture building takes time. Yet when done well, the long term benefits out weighs the set up process. All it takes is posting the protocol on the wall, alongside the team/class norms, and coaching students through the Mediation Protocol until they are confident with handing situations themselves. That—is the ultimate goal.